In those first two panels, Fuzzball is too wide at the bottom. He needs to hit the gym. 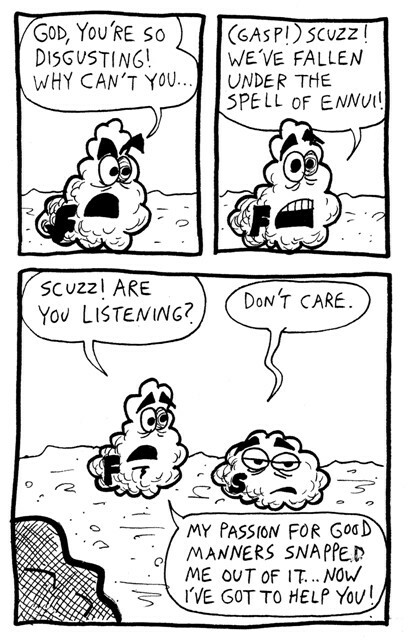 Also, I originally drew an "S" on Fuzzball in the first panel. Note how I did my best to turn it into an "F."
When it was my turn to draw this page, I had no idea what to do. I couldn't think of any reason why they would break the spell of ennui. Then I realized that D.F.F. had already given me the reason on the previous page. It made sense that Scuzzball's burp would irritate Fuzzball into action, even though D.F.F. had only intended that as a joke. Serendipity!